Partnership between government and Henley and Partners credited for never before seen revenue levels from Citizenship by Investment (CBI) Programme. ‘A Bumper Year’ was how Kaisha Ince, Chairperson of the Citizenship by Investment Unit, described the unprecedented levels of revenue yielded from Direct Foreign Investment under the CBI Programme. Ince made these comments during a Special CBI Christmas Cocktail hosted by Henley and Partners in Collaboration with the CBI Unit, to celebrate and mark the culmination of a very successful year for the programme. “In a time where many of the other CBI programmes have struggled to maintain the interest of potential applicants, our programme has seen significant interest from across the globe, and why is that? Simply because our programme and our excellent reputation for operating at the highest standards of international best practices. 2017 proved itself to be the best year ever, since the programme’s commencement in 2014, with an increase of 108% in applications over the previous year. That translates into over $130 million to date – which is a very significant contribution to Grenada’s GDP,” announced Kaisha Ince, Chairperson of the CBI unit. The Head of the CBI Unit also recognised the various stakeholders and agents who worked to make the year one that the country can be proud of. Special mention was made of Henley and Partners – CBI marketing agents and key provider of government advisory services. 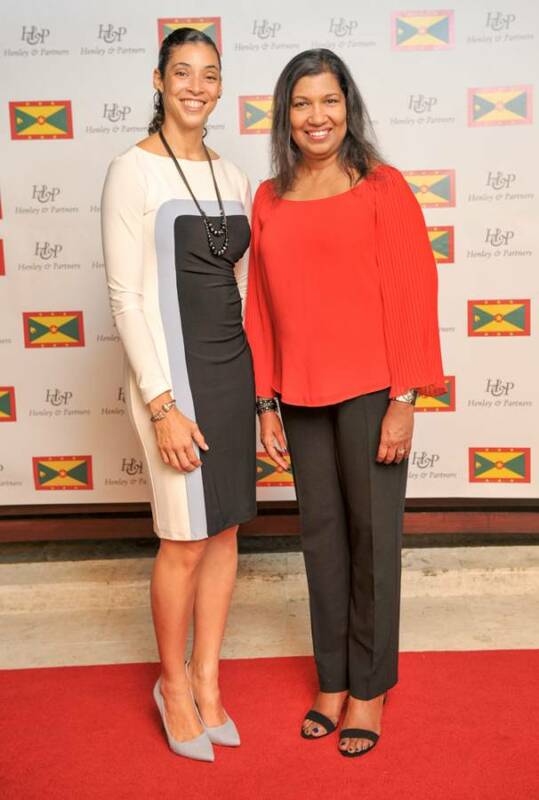 Managing Partner at Henley and Partners Grenada, Andrea St Bernard credited the close working relationship with the CBI Unit as one of the keys to the success of the Programme. “Henley and Partners have been working very closely with the government of Grenada for over a year now, to stimulate the interest in the Grenada programme; to help structure the programme and ensure that the programme benefits all stakeholders. We are very grateful for the wonderful partnership that we have had with the Government of Grenada and the CIP Committee, and we look forward to future collaborations. For this last year I can very confidently say that the most exciting and interesting things in the CBI industry, have been happening right here in Grenada. The Grenada CBI is definitely a premium product and one of the best in the world,” expressed Andrea St Bernard, Managing Partner at Henley and Partners Grenada. The VIP event which took place at the Sandals Le Source brought together developers, CBI and government officials, agents, leaders of local industry, the media and other stakeholders. One of the main developers is Grenada Consul General to Miami, Warren Newfield. He noted that the signs are encouraging for the CBI Programme in Grenada in terms of attracting the level of clientele and developments that the country needs for sustained economic growth and increased employment. “As a developer, to come to develop hotels in Grenada without the CBI programmes is not feasible, for the simple reason [that] the debt equity that you need as a developer to get a proper return on the debt equity is not available in the Eastern Caribbean. So really the CBI is really affording the development of the tourism sector in Grenada,” explained Warren Newfield, Developer/Grenada’s Consul General to Miami. “All the programmes don’t have to be major; we do have some major ones but the smaller programmes help. I have an approved agro-processing project, which means I will bring in a client and to get their citizenship they would have to invest in my project. When they invest the project then gets underway and I can employ locals and grow the business,” describes Oliver Paul, local CBI Agent. CEO of the Grenada Industrial Development Corporation (GIDC), Che Keens- Douglas is heartened by the performance of the programme this year and is optimistic that it will grow from strength to strength. “From our point of view, access to finance is the largest hurdle that we have. So, what the CBI programme allows us to do is to have another tool in our tool belt that can support the growth of quite a few industries throughout Grenada,” noted Che Keens- Douglas. Grenada’s Citizenship by Investment Programme remains one of the premium CBI programmes globally and has been described by the IMF as Gold Standard. The CBI Unit sees a continued trajectory of sustained growth and revenues in 2018. For its part, Henley and Partners – the Government Advisory Service Provider and its most prolific marketing Agent has pledged its continued support and partnership in achieving this goal. This/these programs are godsends to Developers. With respect to Resort/Accomodation Projects – the bulk of the Approved Projects, the Developer gets to sell overpriced accommodations to people who don’t really care what the price is as they regard that mostly as the cost of the Grenadian Passport. This is what they are investing in – a (mostly secret) Grenadian Passport. They pay the asking prices because in their own ways they can use the Passport to make “real” money. This is the real investment to them. With the inflated asking prices of the projects, if a developer is able to sell more than about half of the units, the Project becomes totally self financing while producing a healthy profit to the developer – even if the Development never actually makes it into operation. If by some stroke of luck the project actually does get into operation, the developer gets to operate the Project – again at no financial risks and further profit to themselves. There is a small chance that I could be off base. But, how could one know because other than these self-effacing announcements information seems to be diligently withheld from the public. Could this be that it may not be able to stand up to any inciteful scrutiny?